through my hands: Welcome to Oregon -- World Quilting Travel Adventure has begun! 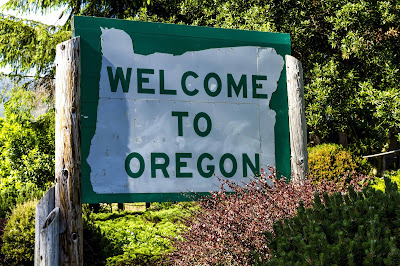 Welcome to Oregon -- World Quilting Travel Adventure has begun! Welcome! It's finally here, and I'm thrilled you are here with me. Everyone who requested their passport has received an email from me with their Oregon souvenir/instructions. Oregon is pronounced OR-UH-GUN, never OR-EE-GONE. We can spot newcomers pretty quick. We have a truly unique state flag. It is the only state flag that is different on each side. Portland, Oregon has more breweries than any other place in the world. We must love our beer! The deepest lake in the United States is in Oregon -- Crater Lake, which is pooled in the remains of a volcano. We love Crater Lake. Oregon residents own more than 1/4 of the country's total llama population. Who doesn't love llamas! We have more ghost towns in the nation -- with 82. We boast having the largest cheese factory in the world -- Tillamook Cheese Factory, in Tillamook, Oregon. I love Tillamook Cheese! Oregon's name is believed to have come from the French word 'ouragan' meaning windstorm or hurricane because of the wickedly powerful Chinook winds of the Columbia River. Trust me on this one. The wind can and does HOWL here without ever taking a breath in the winter. We do NOT love the howling winds! Oregon is one of two states in the U.S. where it is illegal for you to pump your own gas. You must allow the attendant to pump your gas. At last count there were more than 500 vineyards in Oregon. Okay, we love our wine as well. Timberline Lodge on Mt. Hood served as the backdrop for the legendary movie, the Shining. We have a city in Oregon called Sisters and another city in Oregon called Brothers. We love our siblings as well. 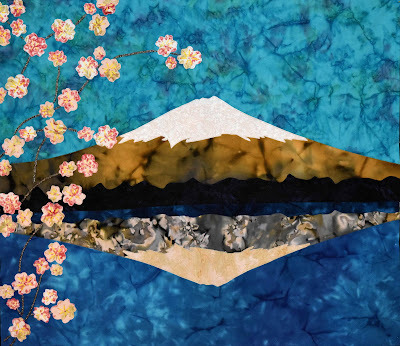 Also, Sisters, Oregon, is internationally recognized as having the largest outdoor quilt show. The largest concentration of wintering bald eagles can be found in Klamath Basin National Wildlife Refuge Complex. Oregon has more than 7,000 bridges, including 53 covered bridges. National TV hit, Grimm is filmed in Oregon. We love our Grimm! I love the feel and beauty of Oregon. The mountains are spectacular and there is a huge amount of forest here. 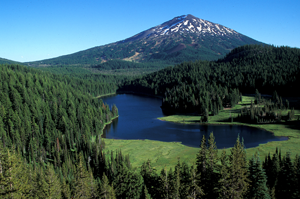 In fact, 48 percent of the total landmass in Oregon is forest, and approximately 60 percent of all of the forestlands in Oregon are owned by the federal government. If you want to get away and enjoy nature at its best, Oregon is a hard place to beat. I love the next picture of Todd Lake. Having the mountain as the backdrop really calms the uncalmable. On most days, the view from my bedroom window is of Mt. Hood. I adore that view. The souvenir for our visit to Oregon is a rendition of my view with some exaggeration. Okay, maybe more than a little exaggeration. There is no water seen in my view so there obviously is no reflection of Mt. Hood in the water. We can see trees somewhat so the tree line smoky view could be true. 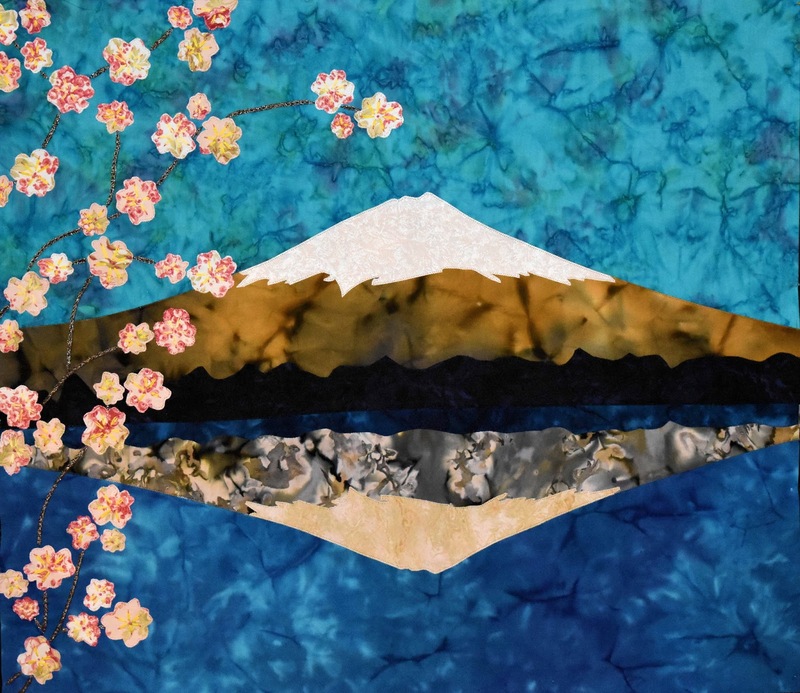 We do have two dogwood trees in our front yard so I imagine taking my camera out and on a perfect picture day capturing the mountain, the sky, the tree line and the water, and the reflection of the mountain and the tree line in the water. I manage to stand just so so so as to capture part of my dogwood tree in the foreground. So without further adieu, Welcome to "View from my Window." This is as it looks on my design wall. I am getting ready to quilt it and will post additional pictures as the month progresses. I plan to add stars in the sky and having a few stars reflected in the water. This will be accomplished with crystals. I also plan to add a half moon to my portrait but I haven't drawn it yet. The size before quilting is 30 inches wide by 26-1/2 tall, which is a perfect Souvenir Size and size for experimentation and play! This next group of photos is to give clarification on the process of getting your portrait to the point of quilting it as shown above. Each person that requested a passport has been emailed the pattern and instructions. I will not be posting them here. If you are late to our travel adventure, the instruction packet will be available on my Craftsy page on September 15. The cost is a low $4.99 if you missed out on the cutoff and would like it. Request your passport and become a follower today and you will receive the next souvenir for free---Alaska! Print off all six pages of your instructions, and then following the instructions to either print the pattern on your home printer or take it to your local printer and have them print it for you on a large format printer. Once your pattern is ready, you get to do some fabric hunting in your stash. I am pleased to tell you that I bought ZERO fabric for this landscape. I even found some tree fabric for the back and leftover batting to use with it. This is a great stash buster! If you plan on washing your landscape, please consider washing your fabrics. I blogged about my washing of the fabrics I used HERE. Once you've chosen your fabrics, lay them out as shown in the picture above and try to visually see if you like your selections. If you like them, pin and mark as instructed in the instructions. 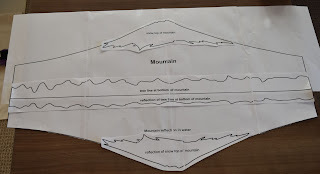 Remember there are no seam allowances in the pattern pieces because I designed it with fusible applique in mind. However, I decided to do a turned under edge for the mountain and reflection of the mountain so I marked exactly as shown on the pattern, but I cut oversized on the top of the mountain so I had an edge to turn under. Add fusible web to the backs of the remaining fabrics and cut out. Don't forget to cut out the water and sky to the sizes shown in pattern. Don't panic looking at the bottom part of the snow. Take your time cutting it out. You want all those funky points and such. This is a lot to throw at you for the first day. I will post again tomorrow and include additional photos as well as a few videos showing the stitching process. Don't feel rushed. Take your time and enjoy the process. Choose your fabrics and then stare at it for awhile to make sure you like it. If you do, get everything cut out and come back here tomorrow while we sew it all together. If you missed the deadline for September's souvenir, the pattern and instructions will be available on my Craftsy page for a low $4.99 on September 15. However, if you sign up and request your passport and become a follower of my blog between now and the end of September, you will receive the next souvenir for free. So don't delay any longer, request your passport and become a follower today! Oh my word!!! What fun is ahead of us!!! How large is this? Love your blossoms on the left side. What did your fabric look like before you cut the out? I look forward to playing with your pattern in a couple of days! The size as you see it is 30 inches wide by 26-1/2 inches tall. Stay tuned for tomorrow's post. It will be heavy with pictures. Thank you for participating!